News affecting your wealth dominated the headlines this past week. Here's a recap. The House of Representatives released details of a proposal revising the U.S Tax Code substantially. 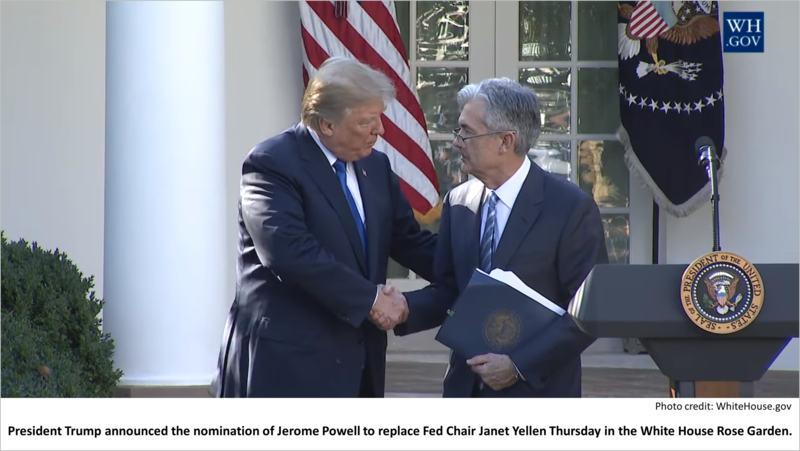 Jerome Powell was nominated by President Trump to replace the current Fed chair, Janet Yellen. The unemployment rate dropped to 4.1% in October, the lowest since December 2000. A surprising burst in productivity occurred last quarter, offsetting rising benefits and wages. The Standard & Poor's 500 closed at an all-time high for the second week in a row. 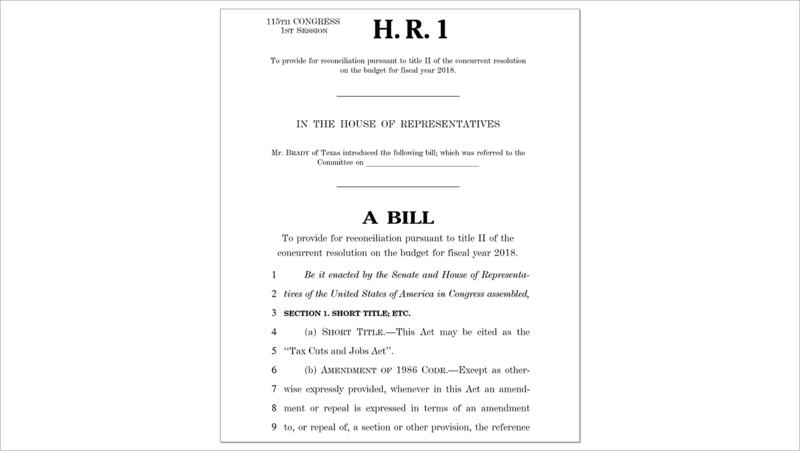 A proposal with sweeping revisions of the U.S. Tax Code was introduced in the House of Representatives. The proposal cuts taxes by $1.5 trillion over 10 years. The proposal redistributes the tax burden of individuals, making winners of some and losers of others. The linchpin of the House plan would raise about $1 trillion of revenue by eliminating the deduction for state, local, and property taxes. Since residents of high-tax places like New York, New Jersey, and California would be losers if the proposal is adopted as is, the fate of this key provision will be negotiated in a politically-charged process in the weeks ahead. The state, local, and property deduction and numerous other controversial changes proposed are expected to meet political opposition and it's possible the final tax reform law could be scaled back significantly. While this complicates year-end tax planning, the tax picture could be clearer by Thanksgiving, by which time much of the political horse trading will likely have been settled. We'll be updating clients with more information as it becomes available in the weeks ahead. In other news affecting your money, President Trump nominated Jerome H. Powell as the next chairman of the U.S. Federal Reserve Board of Governors. Mr. Powell, 64, if approved by Congress, would replace Janet Yellen, who becomes the first Fed chair to serve only a single four-year term. Ms. Yellen had been the first woman ever to hold the chairmanship and the first Democrat in the post since 1987. Mr. Powell, who has been a member of the Board of Governors of the Fed since May 2012, was nominated by President Barack Obama and was the first member of the Fed from an opposition party nominated by a President since 1988, according to Wikipedia. Mr. Powell has supported Janet Yellen's stance on monetary policy and is expected to follow on the course she charted, as the economy has expanded slowly in a recovery from the financial crisis of 2008. Unemployment dropped to 4.1% in October, the lowest rate since December 2000, and the economy created 261,000 net new jobs, the U.S. Bureau of Labor Statistics reported on Friday. Job growth has been stronger for longer than most other recoveries in modern U.S. history. That could be because of the depth of the last recession. 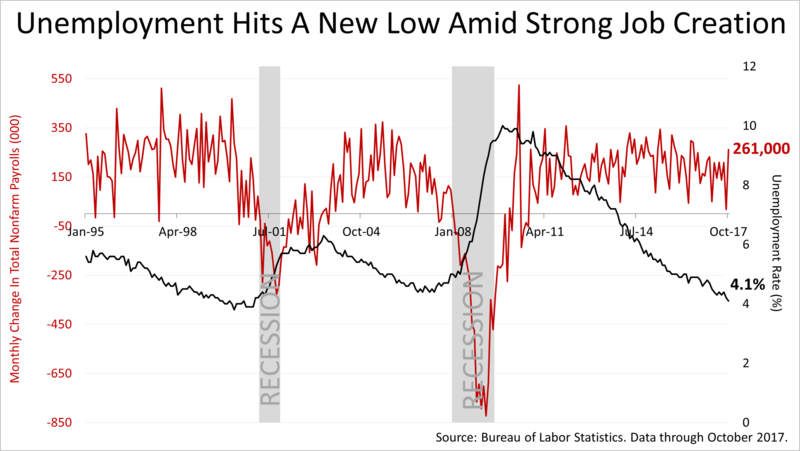 The employment situation is about as good as it gets, and some really good related news also dropped. Growth in real wages of 1.2% for the 12 months through October is nearly double the rate of wage growth in the roaring 1990s expansion! It's four times the rate of growth of the last expansion, from 2000 through 2006. But the real growth in wages is not costing employers as much as what might be expected because of another good economic surprise. Productivity of American workers improved in the third quarter of 2017. 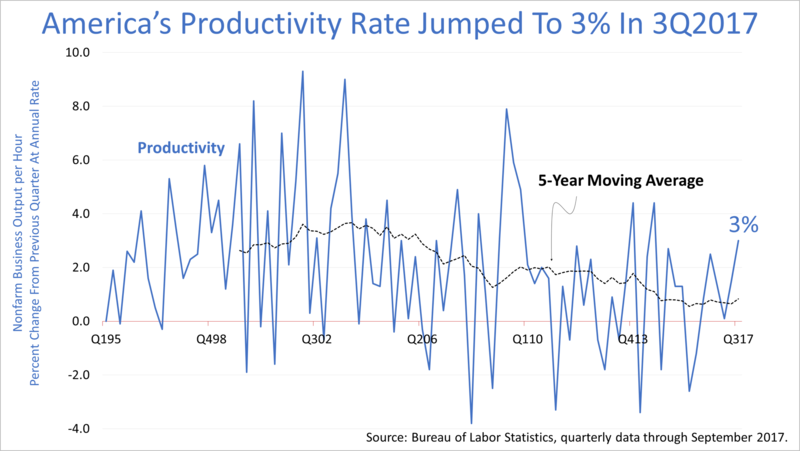 While the productivity rate has averaged 0.8% annually for the last five years, it shot up to 3% in the third quarter. The gain in productivity offset the rise in real wages and benefits. 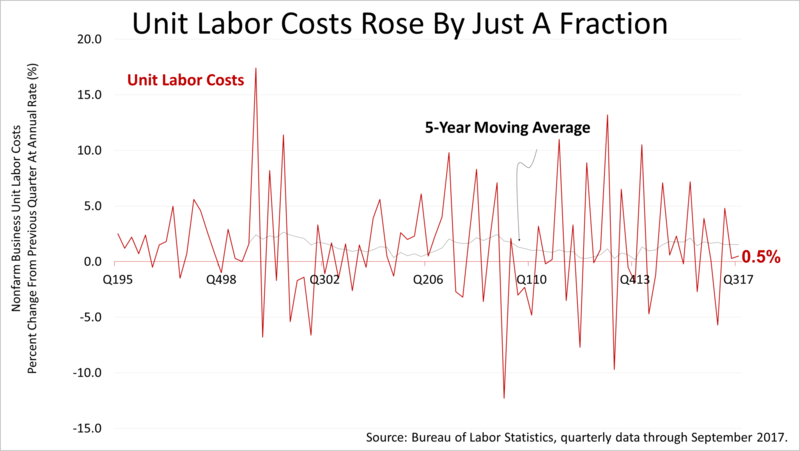 Even though the cost of an employee rose by 2.5%, low inflation and the gain in productivity offset the rise, and an employer's net cost of an employee rose by just 0.5%. With rising labor costs - the main driver of inflation - remaining tame, the Federal Reserve can maintain its easy monetary policy without fears of igniting inflation. All the good news was welcomed on Wall Street. 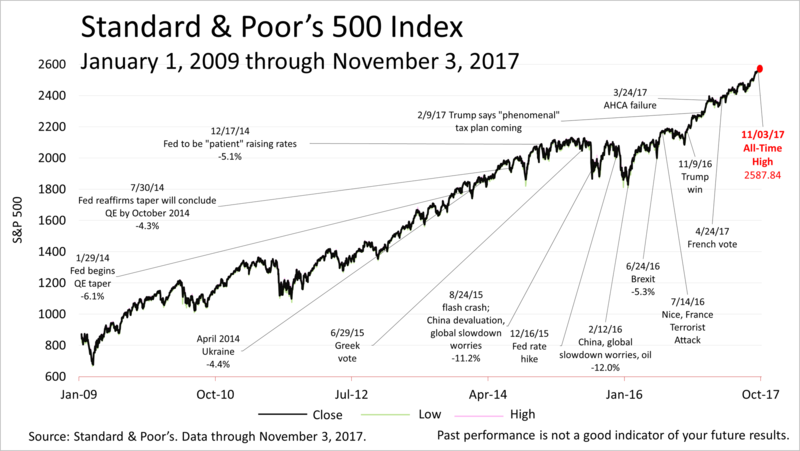 For the second week in a row, the Standard and Poor's 500 closed at a new all-time high of 2587.84. A change in sentiment or an unexpected world event could cause a 10 or 15% drop at any time. In fact, the chance of a bear market decline of 20% or more increases as the eight-and-a-half-year bull market grows older. However, inflation is tame, the employment situation is good, and productivity increased last quarter to keep the cost of employment low amid rising real wages. The average price of a stock in the S&P 500 trades at 19.9 times its trailing 12-month earnings and 17.4 times the consensus bottom-up forecast for 2018 earnings, according to Wall Street analysts' consensus estimates. Investors have not bid stock prices beyond their historical valuation range. The bull market could head much higher and run much longer. 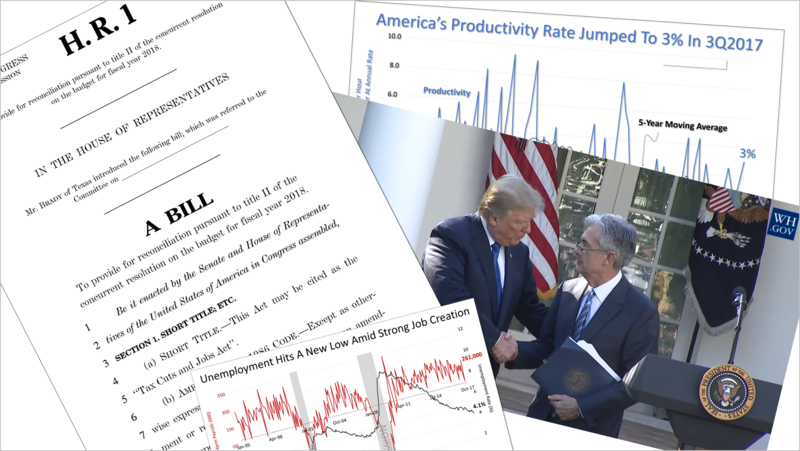 Notes from BLS: The Current Employment Statistics (CES) program produces nonfarm employment series for all employees (AE), production and nonsupervisory employees (PE), and women employees (WE). For AE and PE, CES also produces average hourly earnings (AHE), average weekly hours (AWH), and, in manufacturing industries only, average weekly overtime hours (AWOH). Concurrent with the release of January 2010 data, the CES program began publishing all employee hours and earnings as official BLS series. These series were developed to measure the AHE and AWH of all nonfarm private sector employees and the AWOH of all manufacturing employees. AE hours and earnings were first released as experimental series in April 2007, and included national level estimates at a total private sector level and limited industry detail. Historically, the CES program has published average hours and earnings series for production employees in the goods-producing industries and for non-supervisory employees in the service-providing industries. These employees account for about 82 percent of total private nonfarm employment. 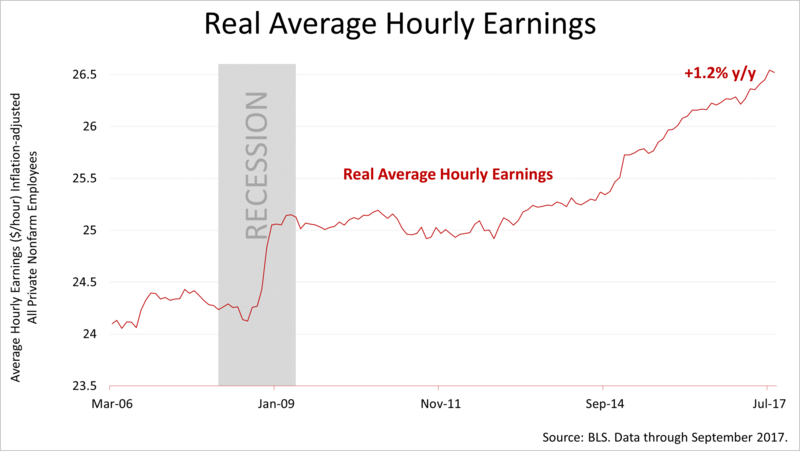 The AE hours and earnings series are more comprehensive in coverage, covering 100 percent of all paid employees in the private sector, thereby providing improved information for analyzing economic trends and for constructing other major economic indicators, including nonfarm productivity and personal income. AE average hours and earnings data are derived from reports of hours and payrolls for all employees. PE average hours and earnings data are derived from reports of production and related employees in manufacturing and mining and logging, construction employees in construction, and nonsupervisory employees in private service-providing industries. AHE includes 100% of non-farm private employees, and excludes benefits and employers' share of payroll taxes. Employment Cost Index: The BLS' ECI is built with fixed weights for individual industries and occupations. Sources: Yardeni Research, Inc. and Thomson Reuters I/B/E/S for actual and estimated operating earnings from 2015. This article was written by a professional financial journalist for Rosenfelt, Siegel & Goldberg, The Investment Center and is not intended as legal or investment advice. ©2019 Advisor Products Inc. All Rights Reserved. All Securities Offered Through The Investment Center, Inc. Bedminster, NJ Member FINRA/SIPC/NASDAQ Advisory Services Provided Through IC Advisory Services, Inc. – An SEC Registered Investment Advisor Rosenfelt, Siegel & Goldberg CPA is not affiliated with The Investment Center, Inc. or IC Advisory Services, Inc.